In a blender, add 5 cups of fresh pineapple, 1 quart of coconut water, the juice of 1 lime, 3 mint leaves and 1/2 of the sugar. Blend on high for about 30 seconds. Using a fine wire mesh strainer, strain the pineapple agua fresca into a large ice tea jar or large pitcher. Prepare another batch and repeat the straining process. Stir well and taste for sweetness, adding sugar if needed. 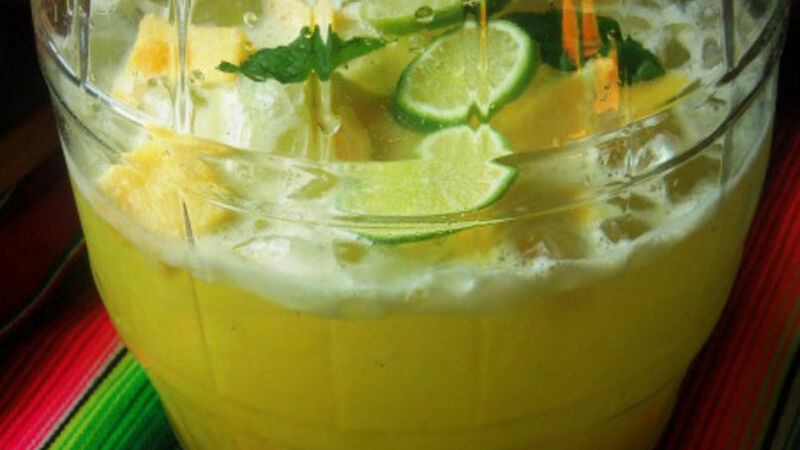 Add the ice, the 2 remaining cups of pineapple, lime slices and mint leaves to the agua fresca, gently stir. Serve right away. Aguas frescas can be prepared a few days in advance. Just add your fresh garnishes and ice right before serving. I remember walking through the mercados in Monterrey, Mexico and enjoying all the colors, sights and smells. I loved the delicious aromas of assorted dishes of authentic Mexican foods as well as the stacks of freshly dried chiles and produce of all kinds. As a child, the stall that always caught my eye was the one surrounded by the huge glass jars filled with freshly made aguas frescas. Some of my favorite flavors were watermelon, cantaloupe and pineapple.